In this article, I will review the commission structure of some of the more prominent brokerages that offer options trading platforms and services. Covered call writing as well as put-selling are short-term strategies that require frequent trading. This is the antithesis of a buy-and-hold strategy. Therefore, commission costs will play a major role in our annualized returns much like expense ratios significantly impact the returns we realize from mutual funds. For this reason, we cannot consider using full-service brokers to execute the sales of our covered calls or cash-secured puts. They simply cost too much. So we turn to online discount brokers who allow us to execute our trades online at reduced commissions, absent the investment advice and other services full-service brokers offer. Most of the major brokerages are reliable, ethical and efficient as it relates to the execution of our trades. They also offer phone support if we experience any problems with the trading platform. They just won’t offer advice unless we are willing to pay for it. Don’t pay for it. You don’t need it. Education is power and will lead to the confidence we need in order to trade like an expert. When doing our due-diligence as to which online discount broker to select we should factor in an evaluation of the quality of the research platforms, minimum cash deposits, and interest earned on deposited cash. But most importantly we should look at the commissions, the fees we pay to have our broker execute our trades. This is especially important to us due to the number of trades option sellers execute. ***PLEASE NOTE THAT THIS CHART IS NOT ALL-INCLUSIVE OF EVERY BROKERAGE TO BE CONSIDERED BUT RATHER A QUALITY LIST OF MANY OF THE MOST WELL-REGARDED ONLINE DISCOUNT BROKERS…THERE ARE OTHERS. A few pennies or a couple of dollars may not seem like a big issue for a single trade but multiply those stats by the number of trades executed in a month, a year and an investment lifetime and all of a sudden we have a significant cash amount that is better off in our pockets than the brokers. The world of online discount brokers is highly competitive and they are all vying for our business so it behooves us to do our due-diligence and keep as much of our hard-earned money as possible. The MSN Money (Microsoft) website has been re-launched and the StockScouter tool is no longer published on the MSN site. The BCI team is taking a dual approach to address this issue. Specifically, we are in the process of exploring other options to StockScouter as well as staying in close communication with Verus Analytics…the supplier of the StockScouter data to MSN. They tell us that StockScouter will be available on other websites as soon as they complete their final contract negotiations with Microsoft. As soon as we have either a replacement screen or we learn where StockScouter will be published, we will get that information to our subscribers immediately. We are currently working with other sites searching for alternatives. If we need to use another tool, we will need time to back test the effectiveness of the replacement tool. Either way, we will be in contact with our subscribers on this issue. For the week, the S&P 500 was up by by 4.1%, for a year-to-date return of 8%, including dividends. GMI: 3/6- sell signal since market close on September 26th. BCI: Moderately bullish splitting the number of in-the-money and out-of-the-money strikes equally. The revised Weekly Report has been uploaded to the premium member site. Look for the report dated 10/24/14 RevA. The sorting issue has been resolved. TD Ameritrade will usually lower their base commission rate to $7.95 if you are considered a preferred customer. They charge more than the others but the ThinkorSwim platform is the best out there. Another broker to consider is Merril Edge. If you meet certain requirements, you can get 30 free stock trades a month. Options are 6.95 + $0.75 per contract. Thank you for your comment. I keep an account at TD Ameritrade but do my trading at Options House because of their superior rates and speedy execution. I recently became a member and have had a chance to review two weekly reports. I believe I understand that the stocks in the last section that are in white (not yellow) are the running list which contains possible candidates. I am using Thinkorswim as my platform. 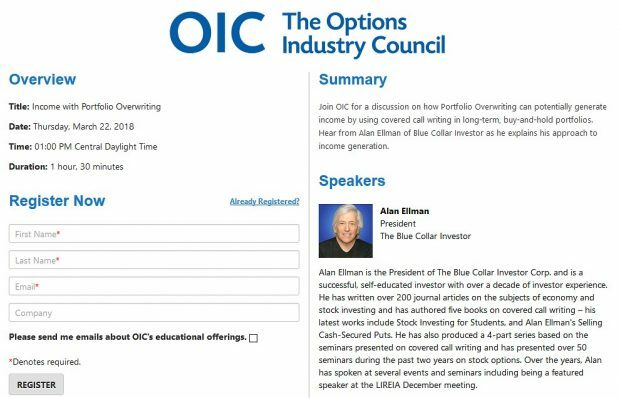 This platform allows the display of a field called %Out of the Money, the likelihood that the stock will not be called away.I have noticed when this likelihood is 70% or higher, there is no premium available to speak of (less than .20) and the percentage in the Ellman calculator is very low.Should I be looking for strikes that have a closer to 50-50 chance of being called out? Even in the 60-65% area the premium seems to be quite low. 1- The stocks in the “running list” that are currently in the “gold” rows will become eligible after the earnings reports pass. 2- The closer a strike is to at-the-money, the greater the time value or our initial profit. The deeper in or out-of-the-money, the lower the time value and therefore our profits. 3- As far as the “likelihood of exercise”, here we are looking at delta. The deeper ITM, the greater the chance of exercise (barring exit strategy execution). The further OTM, the lower the likelihood of exercise. 4- ITM vs. OTM is determined by overall market assessment, chart technicals and personal risk tolerance. All this is detailed in my books and DVDs but suffice it to say that ITM is more conservative and OTM more aggressive. 5- I set my 4-5 week initial goals @ 2-4%/month for the time value component of the premium whether it is ITM, ATM or OTM. This can vary from one investor to another depending on the factors stated above. I am more aggressive in bull markets. To sum up: I look for strikes that meet my 1-month goals and then determine “moneyness” based on the 3 factors mentioned above. 6- There are 3 weeks remaining in the current contracts so returns will appear lower than they did a week ago. What is the strategy with the stock itself, once the options expire ? Is the general feeling that they are then sold, and you start to look at the next group of possibilities ? (I am not referring to stocks that have been held long term, or those that I would have a particular desire to hold). The first thing we look at is to see if there is an upcoming earnings report prior to expiration. If not, the stock is evaluated the same way we analyzed them initially…based on our fundamental, technical and common sense screens. If the stock meets our system criteria and option return goals, it’s in. If not, we find a suitable replacement from our watch list. 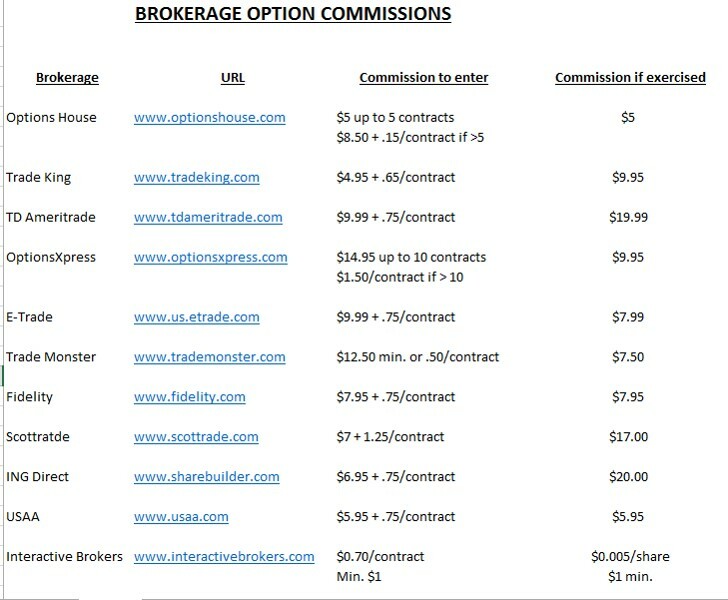 Thanks for the comparison of the brokerage commission rates. There is something wrong with the links to the various URLs as it only takes you to a window with the same comparison chart. The commission rate for Options House is not correct. Their commission according to their website is “Up to 5 contracts for $5 and $1/contract over 5 OR $8.50 + $0.15/contract”. Also, I am surprised you didn’t include TradeStation as they have the 2nd lowest commission rate of all for less than 10 contracts. A flat $1/contract.. Plus a great platform for programming your ideas and doing back-testing. 1- The chart is a screenshot taken from one of my recent books. You need to type in the URL. 2- Thanks for updating The BCI community on the Option House commissions. 3- TradeStation is certainly a viable candidate to consider. I couldn’t include every brokerage and probably should have made note that the list was not all-inclusive…I’ll add an addendum after I post this reply…Thanks for pointing this out. You can also negotiate with most discount brokers if you are an active trader. I negotiated my Scottrade commissions down by 30% to $5 per trade and $5 + $0.5/contract. I use Esignal for charting and have used IB , LIGHTSPEED , TDA , OPTIONSHOUSE , TRADE KING and SCOTTRADE. I just went back to scottrade and negotiated my pricing to .15/contract and $3.95/commission. I typically trade over 5000 contracts/month and have traded upwards of 15k/contracts in a given month. Commissions certainly are a major factor we should consider when selling options especially because of the large number of trades we execute. However, commissions is not the only factor investors consider. Many factor in the trading platform as it relates to efficiency and ease of use. Also, research tools available are important to many investors as are minimum cash requirements and trading requirements. Phone support and types of orders permitted also play roles. One size does not fit all but you are spot on that commissions must be considered.